Clothing should be flexible, non-binding and appropriate to season and temperature. Shorts and a tee-shirt, tights and a leotard or a swimming suit work well and are popular. Do not wear socks or baggy clothing. Practice in a clean, level, warm, well-ventilated and private space. There should be room overhead. It is not recommended to practice in direct sunlight during the middle of the day in Hawaii. Practice only on an empty stomach. Wait three to four hours after a large meal. One to two hours after a light snack. Early morning before any food is taken is the best time of all. A two to three hour practice time, once a day, on a daily basis is ideal for advanced students. This is, of course, not always possible. A half an hour, or an hour, daily is still enough time to benefit from the practice. Under extraordinary circumstances little two to five minute sessions spaced throughout the day are useful. Remember five minutes of practice is far better than none. Yoga is done barefoot. You can do yoga without purchasing any equipment at all! A non-slip, level surface, such as a good hardwood floor, linoleum or a firm rug can provide the stability needed. Carpets and rugs vary greatly as to the traction they provide. Yoga or sticky-mats serve as a basic surface. Many yoga studios also sell yoga mats and props. Some people will find the use of a 9" x 5" x 2" wooden or foam block helpful to achieve the full benefit of poses without strain. Books can substitute for blocks. 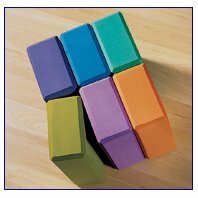 All Iyengar Studios are equipped with props, including mats and blankets. The use of these props is included in the class fee. Yoga practice is modified during a woman's moon cycle. Ladies should not do regular practice during menses flow. . In particular the inverted postures are to be avoided. Vigorous practice or activity can disrupt or stop menses. However, practice of postures like Trikonasana, Baddha Konasana, Balasana and Upavistha Konasana can relive pain around the sacrum and hips, as well as relieve cramps. These poses also promote deeper breathing which is conducive to a meditative state of mind. Consult with a qualified teacher for more details on restorative yoga and this type of practice. Yoga practice is beneficial during pregnancy, and can ease many of the discomforts involved during pregnancy as well as strengthen the body in preparation for childbirth. However, certain postures are not advisable, and, as fetal development proceeds, more postures need to be eliminated from the series. New students should attend special prenatal yoga classes with the consent of their physician! Yoga is naturally therapeutic and generates excellent health. However, the use of yoga for specific health problems should be done under personal guidance with the consultation of a physician. Yoga teaches proper alignment and breathing, which is, of course, beneficial to health. But when trying to cure serious health problems, individual instruction is imperative. Always seek the guidance of qualified health professionals. This on-line article is an edited version of the original. For full article, see front page O�ahu Island News, August 2002 edition.